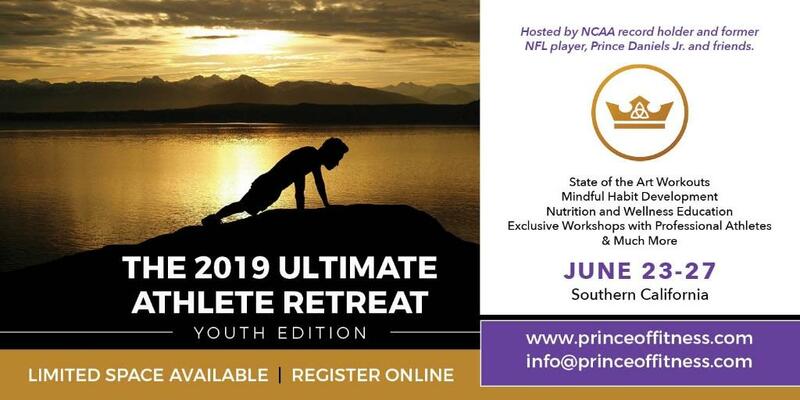 This five-day Ultimate Athlete Retreat experience will help youth boys athletes (ages 12-17) develop the habits and skills that will be needed to not only become the ultimate athlete, but also the ultimate human being. The dynamics of this program are suitable for any sport and is ideal for athletes with a positive mindset ready to advance their game to the highest level. This retreat is hosted by former NFL RB, NCAA record holder and current fitness and mindfulness expert Prince Daniels Jr. Co-hosted by former NFL WR, collegiate Hall of Fame and arguably one of the top five greatest WR in NFL history, Calvin Johnson Jr. Calvin and Prince joined forces to teach youth about the importance of balancing peace and power. Equipping athletes with the tools to take their game to the highest level. The Ultimate Athlete Retreat aims to help youth foster the balance between peace and power. Peace without power is too passive and power without peace is too destructive and dangerous. We value safety, respect, and selflessness towards others. We work hard to maintain a well-rounded experience of performance, fun, and growth in each athlete. Special attention is given to ensure that every athlete leaves the retreat stronger in body, keener in mind, nobler in character, more appreciative of nature, and more confident in themselves. Pricing includes food, lodging, activities, and transportation from San Diego to Big Bear. Airfare is not included. To maintain the safety and privacy of participants and guests, the exact location of the event will not be disclosed publicly; the event will be held at a private, secure residence and will be disclosed after event registration or can be disclosed upon inquiry.